Often in assembly applications, it is necessary to track the position and orientation on one object relative to another in real-time. This requires more than the standard single-point measurement often available with real-time measurement systems. To address this need, New River Kinematics (NRK) developed TransTrack, a 6D transformation tracking application that interfaces directly to SpatialAnalyzer® (SA). TransTrack takes simultaneous input from 3 or more measurement instruments (3 Laser Trackers in the case shown above), and determines the resulting transformation in real-time. The transformation is then integrated into SA in real-time so the CAD objects move in the model. By using object relationships in SA, you can watch the distance between points and the relationship between frames as the objects move. This is especially useful if you wish to guide an assembly process based on several feedback points. One of the powerful features of this system is the beam recovery procedure. 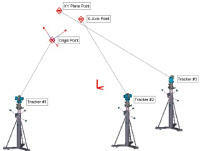 Using 3 trackers without ADM capability, TransTrack can recover from a broken beam and reset the interferometer distance more accurately than using an ADM measurement. This capability makes the system extremely tolerant of broken beams due to physical interference, dust, or SMR acceptance angle.